Frit Picture in progress. Just 2 more layers needed to complete! 2018 - Where did it go? I can’t believe that almost a year has gone by without me adding another blog post! Where did it go? 2018 was a whirlwind of glass, shows, travel, theater, opera, family, good friends and so much more. I have been hard at work developing new glass pieces and just trying to keep up with things in general. The challenges associated with the redevelopment of my principal glass source, the resultant problems of distribution, the discontinuance of several types of glass that I used heavily, and the erratic availability of what is being made, have caused my head to spin. I finally decided that it is OK to say that I can’t produce patterns that people have grown fond of and that I can and will forge ahead with new patterns and ideas that I have developed and find exciting. 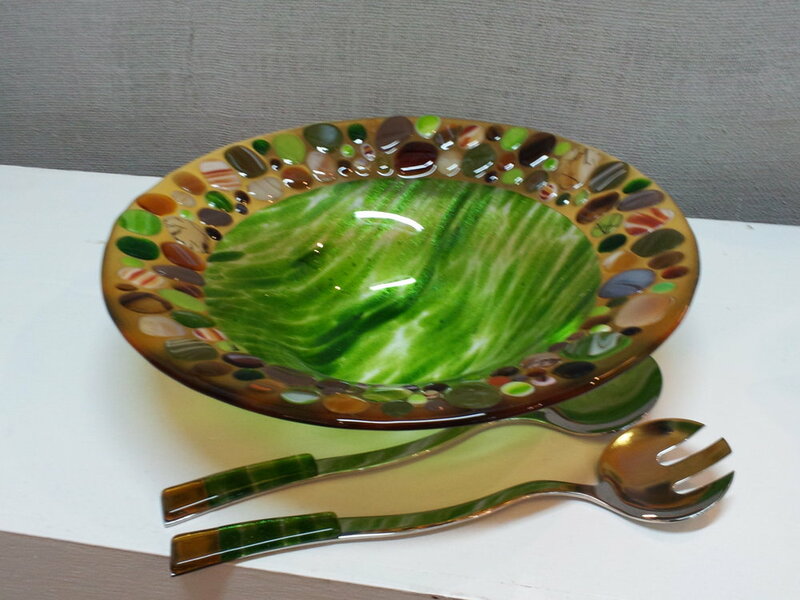 I have taken some truly wonderful glass classes that have opened up new possibilities for me to explore. Last spring I took a class at the Bullseye Resource Center, NY that touched on several pictorial glass techniques that were new to me. I was inspired to try new things with my glass work with results that I found exciting and rewarding in both my functional and decorative glass. In the fall I took another class with Miriam de Fiore in landscapes. She is a wonderful teacher and I always come away with several nuggets of glass knowledge. Miriam is my glass guru and I owe her so much for her generous sharing of her techniques and knowledge. I'm new at this Blog thing so bear with me as I learn. I've been so excited this week learning to set up my website. This is the first site I have done for myself and it has been a challenge. My old website was fine when it was set up years ago, but I like the more modern look of this new site and keeping it up to date will be a breeze.